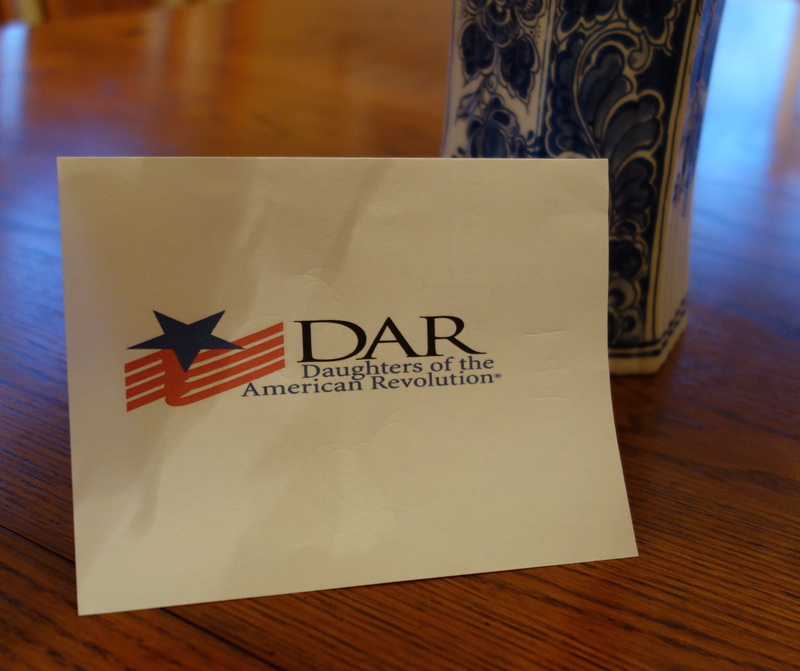 This past Saturday I was inducted into the Cooch’s Bridge Chapter of the National Society of the Daughters of the American Revolution. It was overwhelmingly wonderful and quite surreal, and the culmination of nearly thirty years of research into my Bursley family. It would never have been possible without the collaboration with my third and fourth cousins, and underscores the importance of finding others who are researching your lines. Joseph Warren Day, the youngest son of Aaron Day and his wife Martha. (We share 63.8 cM’s.) An Ancestry.com autosomal test provided two additional genetic matches – both to two separate descendant’s of Aaron’s oldest son, Nathaniel. Our shared, documented family trees demonstrate we are 4th cousins once removed, consistent with the relationship Ancestry predicted by the portion of shared DNA. Naming conventions. Cynthia (Day) Bursley named her youngest children Aaron Day Bursley and Martha Eliza Bursley. Cynthia’s presumed brother, Nathaniel, also named one of his daughters Cynthia. This latter Cynthia, daughter of Nathaniel, married Benjamin Lovejoy on 9 Oct 1864 in Medford, Piscataquis County, Maine. my own copy of it in the photo album originally owned by my great, great grandmother, Lavina (Bursley) Stanwood, daughter of Cynthia (Day) Bursley. While the photo identification appears to be incorrect (Cynthia Lovejoy lived in Maine where she died in 1867, age 29, and the photo was taken in Minneapolis, Minnesota in 1871 or later), it establishes an undeniable connection between my Cynthia (Day) Bursley and the Day family of Plymouth, Hennepin County, Minnesota, where Nathaniel Day, father of Cynthia (Day) Lovejoy, and presumed brother of Cynthia (Day) Bursley, resided. Physical proximity in Maine. In 1854, Benjamin Bursley, husband of Cynthia Day, was the town clerk for Kilmarnock (now Medford) Maine, where Aaron Day was enumerated on the 1860 Federal Census. Physical proximity in Minnesota. Benjamin and Cynthia (Day) Bursley moved to Minnesota in 1854, about three years prior to Cynthia’s presumed nephews, Francis and Amos, and 11 years prior to her presumed brother, Nathaniel. Nearby cousins. A family story was passed down to Cynthia (Day) Bursley’s great granddaughter, Goldie Simpson, regarding the 1862 Dakota Uprising. The story states that Cynthia’s daughter, Lavina Bursley, witnessed the scalping of a cousin by Indians. While no evidence has surfaced that this occurred, it is highly unlikely the story would have been rumored had there not been extended family and cousins in the region. Thanks to collaboration with a newly discovered fifth cousin, I’m on my way to understanding who Cynthia (Day) Bursley’s ancestors were, and getting to know another branch on my family tree. This entry was posted on Thursday, March 20th, 2014 at 9:01 PM	and posted in Bursley, Day, DNA, My Family Lines. You can follow any responses to this entry through the RSS 2.0 feed. I am happy with all of this. Now, who is Martha? David, one can hope DNA can help us with that question too eventually! Congratulations on your induction into the Daughters of the American Revolution and your acceptance into the Mayflower Society! Your enthusiasm is contagious! A great-grandaunt of mine was a member of both organizations, but I haven’t done much family history research in recent years due to heavy family obligations. Hoping to get back into it soon. It’s refreshing and inspiring to read about how thorough your research has been. Thank you, Barbara! I hope you are able to find some time to start researching again, but in the meantime, I sure enjoy YOUR blog with all your New England pictures!